This is by no means a complete listing of all of the movies relating to World War I. The movies that are included here are the ones where I had stills. D.W. Griffith in France, 1917, filming Hearts of the World. 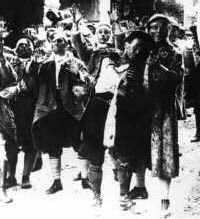 Dead soldiers march the streets in Abel Gance's 1919 J'accuse. The famous dogfight scene from William Wellman's 1927 classic Wings. 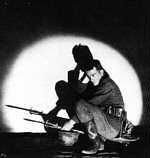 Lew Ayres as Paul Baumer in Lewis Milestone's 1930 version of All Quiet on the Western Front. 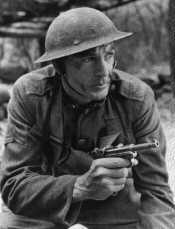 Gary Cooper as Sergeant Alvin C. York in Howard Hawks' 1941 Sergeant York. This list was contributed by Michael E. Hanlon, Research Editor of ø Relevance, the Quarterly Journal of ø The Great War Society. available with an English narration dubbed-over the French. sledgehammer wielding maniacs are haunting. Fictional work using the Great War in Africa as a backdrop. vilized' Europeans. Academy Award for Best Foreign Film. the characters are much better developed. Spy and love story set in Sweden during the Great War. One of very few remakes considered better than the original. 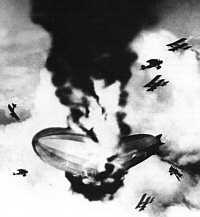 This movie has inspired much interest in WW1 aviation. powerful. The 1930 version is also pretty good, however. 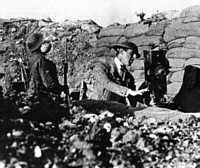 David Lean produced a trilogy on the days of the Great War. the Great War on the Italian Front. it employees, it's still entertaining. be seen over and over. scope, but less detailed than the book. master of the medium that features reconstructed battle scenes. the Kaiser. Features the Gish sisters, Lillian and Dorothy. ing sequences which were filmed over San Francisco Bay. but video tapes are out there somewhere. Thoroughly dismal story of a thoroughly disabled veteran. Timothy Bottoms as the guest of honor. went to EmiL Jannings for his portrayal of the ex-officer. of the French Unknown Soldier at the Verdun Citadel. charge is worth the price of admission itself. long look at their experiences. A favorite of this author. though not commonly seen in stores. available commerciallly, but can be caught on cable television. almost helplessly as they are railroaded to their deaths. dilemma to his doctors.Little known, but powerful film. their struggles at the front. A great TV experience. became President. Kind of boring, though. Clara Bow with an appearance by a young Gary Cooper. and is periodically reshown on cable television in the US.